Alkaline soils are soils with a pH of over 7.0. A high pH means the soil contains more lime or calcium carbonate. When soil has a pH above 8.0 the soil's ability to retain oxygen is affected and the number of plants that can thrive becomes limited. You can learn the pH of your soil with a home soil test kit available at most larger nurseries or by contacting your Local County Agricultural Extension Office. Eastern Redcedar (Juniperus virginiana) adapts to the moisture level and pH of the soil. In dry alkaline soils, Eastern Redcedar is a multi-branched shrubby tree that grows to 20 feet tall and 15 feet wide, and can live to 100 years or more. Eastern Redcedar is used as a screen or specimen tree in a landscape. The dense shade beneath the evergreen Eastern Redcedar tree prevents most plants from thriving under its canopy. The Bur Oak (Quercus macrocarpa) is a majestic spreading tree with an open spreading habit. It grows to 80 feet or more with a spread of 40 feet. The Bur Oak is very drought tolerant once established, and can live for several hundred years. It has long leaves to 12 inches and produces golf-ball-sized acorns once the tree reaches abound 20 years old. The bur oak is a highly desirable landscape tree for areas with alkaline soil. Boxwood (Buxus microphylla) is an evergreen shrub suitable for home landscapes. It is commonly used to form a dense hedge in sunny locations. Boxwood is a slow growing shrub and may take 10 years or more to reach its eventual height of 15 feet, but it looks best if planted up to 2 feet apart and pruned regularly to form an attractive hedge. Bigleaf hydrangea (Hydrangea macrophylla) is the variety of hydrangeamost commonly seen growing in landscapes throughout the U.S. It produces large round flowers that consist of hundreds of smaller blooms of pink or blue. Hydrangeas change their bloom color according to the soil's pH level. In alkaline soil, hydrangeas eventually produce pink blooms even if they had blue blooms when in a nursery or florist shop. Hydrangeas grow best in a moist location protected from the afternoon sun. They grow to 5 feet high by 5 feet wide under optimal conditions. Russian Sage (Perovskia) produces blue or lavender blooms, depending on the variety, throughout the growing season so long as the old blooms are removed from the plant after each bloom period. The aromatic foliage is light and feathery, and the plant looks best as a specimen plant in the back of the garden, or planted 2 to 3 feet apart in long borders. It grows to 36 inches tall and wide and prefers well-drained locations in full sun. It is a hardy perennial and can be grown in areas where many plants cannot grow due to high alkaline soil. Lavender (Lavandula angustifolia) is one of the most desirable herbs for the herb garden. Both the silvery leaves and upright purple blooms are highly fragrant. It can be used in borders or as a specimen plant. It grows best in well-drained dry alkaline soil and is not tolerant of boggy or wet conditions. Lavender blooms can be harvested and dried to use in dry flower arrangements. It grows to 32 inches tall and wide. There are many varieties available to choose from and all are suitable for alkaline soil conditions. 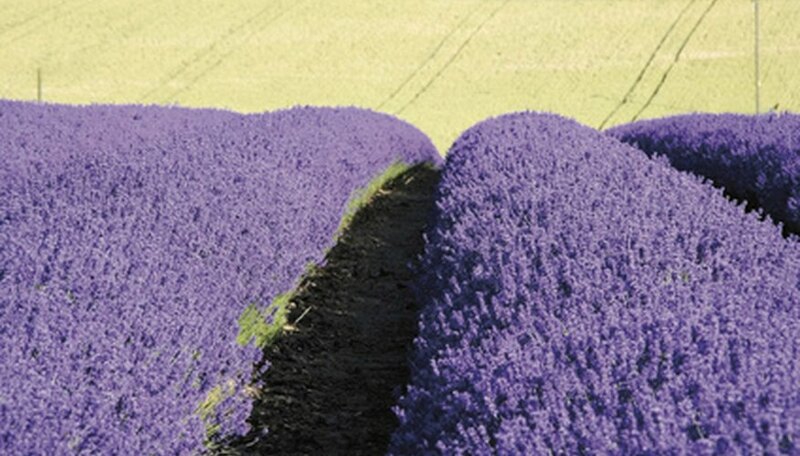 Some varieties of lavender have pink or dark purple blossoms. Thyme (Thymus spp) is a low-growing woody perennial herb that likes alkaline soil conditions. It produces light blue flowers in the spring, and its silvery grey or green foliage is highly aromatic. Choose from many varieties of thyme--the largest grows to 32 inches tall and wide. Use the leaves of the thyme plant as a spice in Mediterranean dishes.